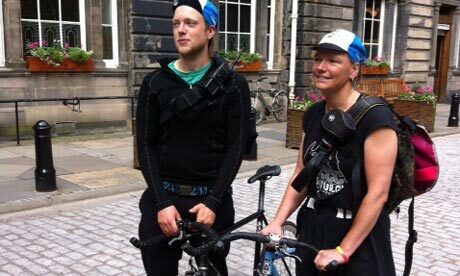 Ready to take on the world’s best cycle couriers on Edinburgh’s streets? If it’s not the endless hills and ancient cobbles, it’s the tangle of tramworks tying up much of the city centre. Cycling in central Edinburgh can be a challenge for the most experienced rider. For cycle couriers it can be akin to a daily assault course. Next week, the city’s bike messengers will pit themselves against the best in the world as Edinburgh hosts the European Cycle Messenger Championships. It’s the 17th year of the competition but the first to open its doors to any cyclist who thinks they can match the pace and panache of the couriers: trousers rolled up, radio holsters strapped on, D-lock in the back pocket. “Over the years, couriers have been this kind of subculture, kind of us and them, so this year we’re really trying to involve everybody,” says Eva Ballin, 41, a veteran Edinburgh bike messenger and organiser of this year’s event.